Forces a higher zoom level. Use RTResolution as a workaround. Change in settings or toggle with Alt+↵ Enter. Causes tooltip flickering, faster menu scrolling, and faster item crafting/buying. Fully customizable plus many presets. 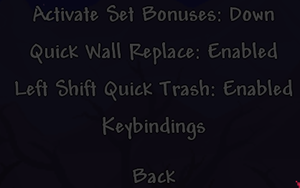 Can set deadzones; game uses a cursor so sensitivity is unneeded. Can invert X and Y axis on both thumbsticks. Low-quality official localization with numerous issues. For dedicated server use, run standalone command-line binary located in the root of the installation folder TerrariaServer.bin_x86_64 (64 bit, Linux and MacOS, _x86 for 32 bit) or TerrariaServer.exe (Windows). 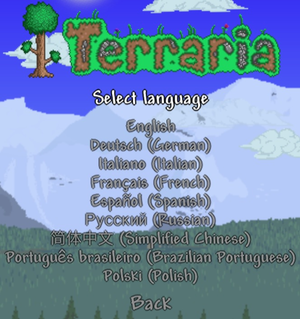 The German (Steam) version of Terraria has currently lots of bugs and crashes (for example social slot items), the only fix is to set the language to English. This usually happens when the game is running on an older PC. In Settings make sure Frame Skip is set to "On" and Lighting is set to "Retro". This should increase performance. The OS X and Linux versions of the game use older version of FNA. Updating to newer version makes the game faster. Copy and run a script to update FNA. Make sure to install .NET 4 before installing XNA 4. If that does not solve the issue, try uninstalling both of these and installing a clean copy of both. Check to make sure you have the most recent updates to your graphics card. You can do this through Steam (in Windows) by pressing (in the top right corner) 'Steam' > 'Check for Video Driver Updates...'. Also check to make sure you have the most recent version of DirectX. 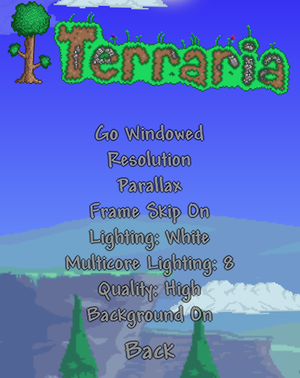 You should also check the list of XNA's Officially Supported Graphics Cards (XNA is the engine Terraria runs in) for your graphics card. 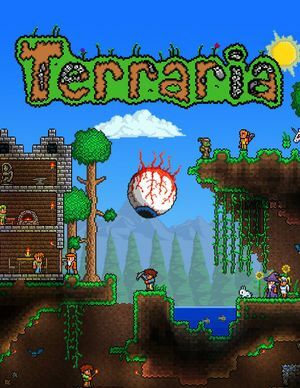 Make sure your Firewall is off or that it allows Terraria Network Access. 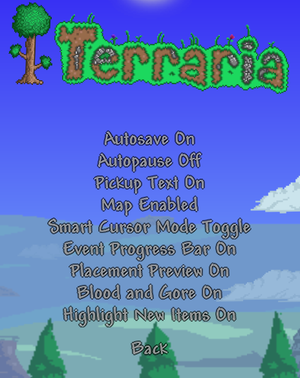 View this forum thread to get information on giving Terraria Network Access. Look up port forwarding if you are trying to host behind a router. If all else fails, you can use the third party program Hamachi. This allows you to more simply host a server without having to forward your ports. Try launching again, and make sure you have set both Steam and Terraria.exe to launch as administrator (Windows Vista and Windows 7). This will make sure all of your game files are up to date and automatically replace any damaged files. 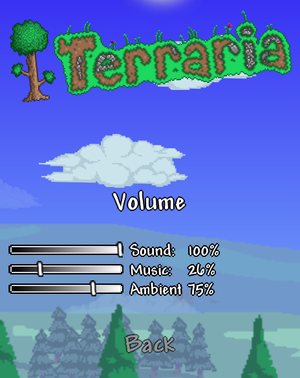 Switching to Cloud takes the files off your computer, from %USERPROFILE%\Documents\My Games\Terraria\ Aside from your .plr player file which keeps character info, what we're interested in are the .map files. For various reasons what can happen is that the file that gets downloaded back either has one extra period before the extension, say 11111..map instead of 11111.map, or doesn't get downloaded at all. If it has extra periods, remove and keep the extension. If you don't see the extension then just remove all extra periods at the end of it. If you don't have your map data files there, try looking in your Steam cloud temporary folder which can be found at <Steam-folder>\userdata\<user-id>\105600\remote It should be there. If it ain't there or in your My Documents location, get a file recovery software (i have had luck with Recuva) and point it in the Steam cloud temporary location. With luck it's recoverable. (this can happen when no valid files are present in the my docs location, so you cloud, local then cloud). If you have more than one set of files, go for the most recent set (the one with more periods or last modified date is latest) and remember that each is saved per world you character has visited. Upon next game start, the hints for controller buttons will be hidden and the mouse will be visible. 3.0 OS X and Linux only. This page was last edited on 23 April 2019, at 20:30.